Here is a handy reference page with all the Diesels I’ve built or designed. Although I do not currently have a Diesel built, I have two in a Digital Design phase, one of which is far enough along that it has a WIP post. 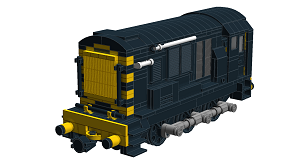 British Rails Class-08 Diesel – WIP!! EMD E7 – Future Project, Minimal Work Done! Sadly, as there has been next to no work or time put into this engine yet, I do not have a page or even a picture. Currently there are several other projects ahead of this one, so it may be a while. Rest assured though E7 fans, it will definitely be done at some point!